These kits are plated with TN (Titanium Nitride) to give an absolutely permanent finish that looks like gold plating. 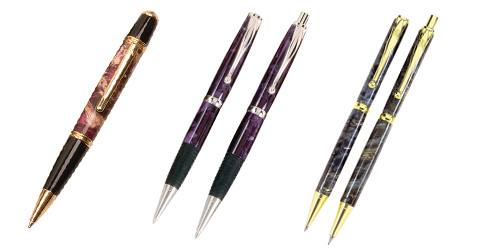 Even with hard use the plating on these pens will not wear off like normal gold plating can. If you are looking for the best quality, these are the kits to use. We offer our most popular kits with TN Plating. All the clips in this series have a distinctive TN on the clip to show their quality. They are all turned on our standard pen mandrel.